From a seriously groundbreaking “Vanity Fair” cover model to a sporting trifecta, see what the Internet was searching for this week. Caitlyn Jenner topped the trends this week, with more than 10 million searches since she introduced herself to the world on Monday with a “Vanity Fair” cover story. Her high-profile transition has put Jenner at the center of an active national dialogue about transgender equality and rights. 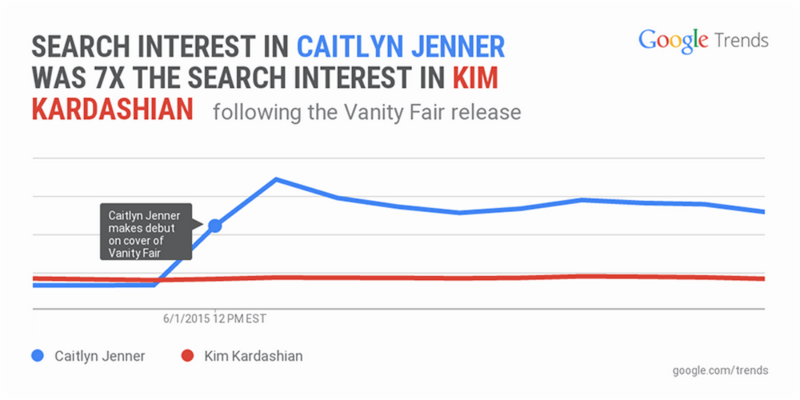 The news dominated headlines and news feeds for several days—in fact, searches for Jenner were nearly seven times higher than than searches for Kim Kardashian, who announced her second pregnancy with husband Kanye West over the weekend. Another well-known family shared the search spotlight this week, although for very different reasons. Beau Biden, Delaware attorney general and son of Vice President Joe Biden, died of brain cancer on May 30. Searches for news about his life and death topped 100,000 ahead of memorial services held in his honor on Thursday, Friday and Saturday. 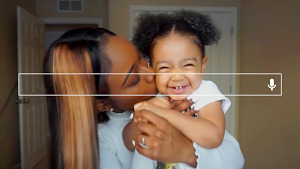 With the NBA and Stanley Cup finals underway, and the Women’s World Cup set to kick off over the weekend, it was a particularly sports-heavy week on search. 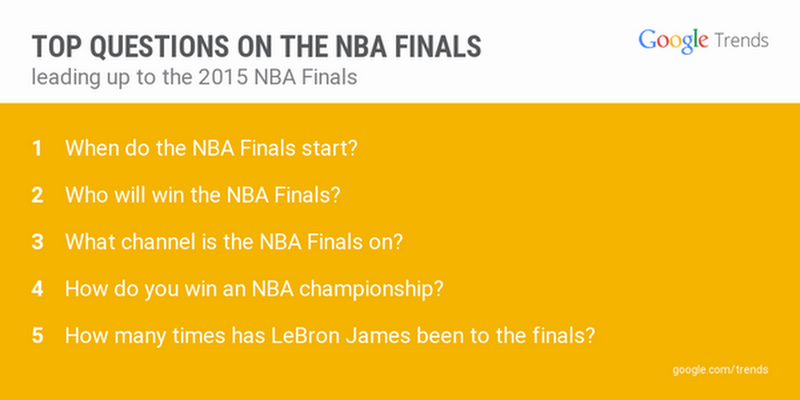 People wanted to know where and when to tune in for the NBA games, and while “How many times has Lebron James been to the finals” was one of the top questions, searches for Warriors star Steph Curry were higher than searches for James in nearly every state. On the hockey front, the Chicago Blackhawks, who currently lead the series 1-0, are also dominating the search trends over the Tampa Bay Lightning. Meanwhile, soccer fans are heading to Google to search for Women’s World Cup teams and players as they await to see who emerges from the tournament’s group-stage. It may not be June 21 yet, but school is out, temperatures are up and Memorial Day weekend is practically a distant memory. Summer is here, and for everyone looking to get out of town, Southwest Airlines had just the thing: a 72-hour sale. With plane tickets at less than $100, turns out too many people wanted to get out of town—traffic from would-be travelers crashed Southwest’s website for two days, while searches about the sale and the site topped 500,000. No time to watch the game this weekend? Find out what you missed—just ask the Google app, “Who won the Warriors game?” to get box scores, video highlights and more.